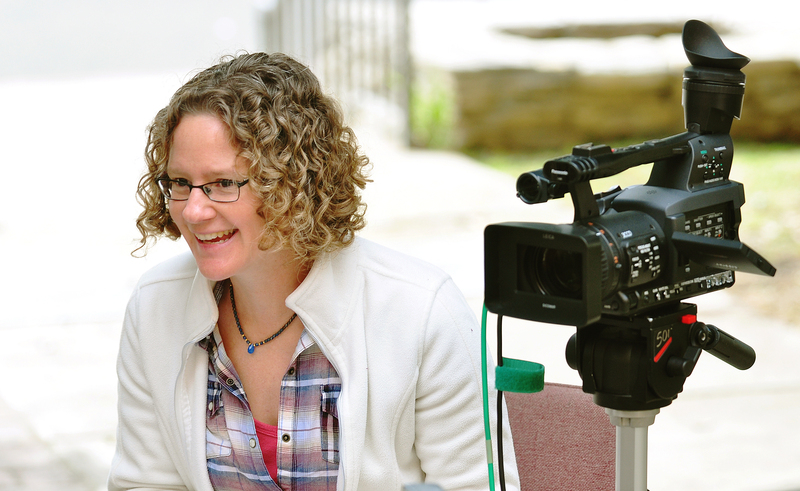 In 1997, Betsy Kalin '91CC formed Itchy Bee Productions, a full-service production and distribution company, specializing in high-quality films that entertain, educate, and inspire. The director received a BA in Women's Studies from Columbia College and an MFA in Directing from the University of Miami. Kalin recently completed a nine-year-long film project, East LA Interchange. CAA Arts Access spoke with Kalin about this undertaking. Your recent film project, East LA Interchange, was a labor of love, nine years in the making. How do you know when your story is finished and when is it time to walk away? It varies from project to project but I think you have to keep in mind the arc of your story. It was important to me to follow the story from the 1940s to the present in order to show how the neighborhood has had to fight against outside forces in the past and how this continues into the present. Following the story to the present day also allows our audiences to see the parallels between the past and current hot-button issues of multiculturalism, immigrant rights, and gentrification in the U.S. While you were at Columbia, you majored in Women's Studies. Could you let us know your career path and how it led you into your current field? I majored in Women's Studies and I minored in English since there wasn't a Film minor at the time. This actually meant that I was taking as many film classes as I could but they were labeled English. I was also active at the student television station and with the 8mm film club so I was very focused on pursuing my interest in film while at Columbia. I loved the film classes I took with Molly Haskell, James Schamus, Annette Insdorf, and Stefan Sharff. I think it was an amazing opportunity that Columbia College allowed undergraduates to take classes at the Film School and it really cemented my desire to be a filmmaker. After graduation, I worked for documentary filmmakers in San Francisco and then went back to school for my MFA in directing. When I moved to Los Angeles, I worked as a production assistant, production coordinator and assistant director before directing and producing my own projects. While I attended Columbia, I interned at Women Make Movies and I knew then that I wanted to be a filmmaker. Because I had access to their whole catalogue of films, I had many examples of female filmmakers who made their living in the arts. I was also able to meet filmmakers and learn more about filmmaking as a career. I think that working at Women Make Movies was really essential for me to discover that filmmaking was my passion and what I wanted to do with my life, and that I wouldn't be happy unless I pursued being a filmmaker. You really have to love what you do because of the enormous obstacles and difficulties with filmmaking. You may get this question a lot, but why do you think there are so few women in filmmaking? I don't think that there are so few women filmmakers. I think most people haven't heard of many women filmmakers because it's so challenging to not only get your film made, but to get it distributed and marketed widely. There's been a lot of movement in the last two years about the dismal statistics about women in Hollywood which I hope will help improve the sexism in hiring practices here in the U.S. From personal experience, I know that the industry makes it difficult for women in cinematography, sound, writing, and directing. However, there are plenty of women filmmakers. The industry bias just means that you have to search harder to find them. Go see independent and Hollywood films directed by women, attend film festivals, search YouTube and other online platforms, go to museums, see student work, and show women filmmakers that you support their work. What advice do you have for any young, aspiring directors who want to get started? My advice is to not let anyone tell you what you can and can't do. If you want to make a film, find any way you can to make a film. If you have to write it, shoot it, edit it, and direct it yourself, do it. The most important thing is to keep making work and to learn from the process. I think a lot of people are afraid of failing, but being afraid of making mistakes keeps people from trying to achieve their dreams. Failing is really one of the best ways we have to learn. The other advice I have is to reach out to people who inspire you. I strongly believe in the mentorship system and think it's invaluable in helping young directors find their way. Can you tell us what you are working on and any upcoming projects? Even though East LA Interchange is out on the festival circuit, we're still fundraising to get Spanish subtitles and Closed Captioning so we can screen the film in Boyle Heights to everyone in the community, not just English speakers. We're also fundraising for an outreach campaign to screen the film in communities across the country that are dealing with the same issues as Boyle Heights of highway development, environmental pollution, community organizing, immigrants' rights and gentrification. We also want to bring the film into schools and universities as an educational tool in History, Urban Planning, Ethnic Studies, Sociology, American Studies, Geography, Political Science, Environmental Studies, and Film. If anyone is interested in contributing, donations are tax-deductible and all amounts are welcome: https://bluewatermedia.org/Donate.aspx. I'm also in the research phase of a new feature documentary about a peace activist from the 1960s and beginning work on a documentary web series with my wife, the filmmaker, and photographer Chris Chew.